The West Green Road/Seven Sisters Development Trust’s first project is to deliver the community plan for Wards Corner (download at https://wardscornercommunityplan.files.wordpress.com/2013/10/d-a-s-rev-a-wcc-2013-10-07.pdf). The Trust has recently been accepted on Locality’s ‘First Steps’ programme, run by the Community Development Foundation (CDF). This gives us £2,500 to develop a community action plan to guide our future work, skills and leadership training and four days’ support from Alice Wilcock, director of CDF. Further details about the Trust’s First Steps project are in the slidepack below, as presented at the public meeting on 16 July. One chance to see the highly-praised exhibition about Tottnm workplaces and skills threatened by development – it showed in Clerkenwell before, now here is one chance to see it in Tottenham. OK maybe not quite SoTo but still relevant. 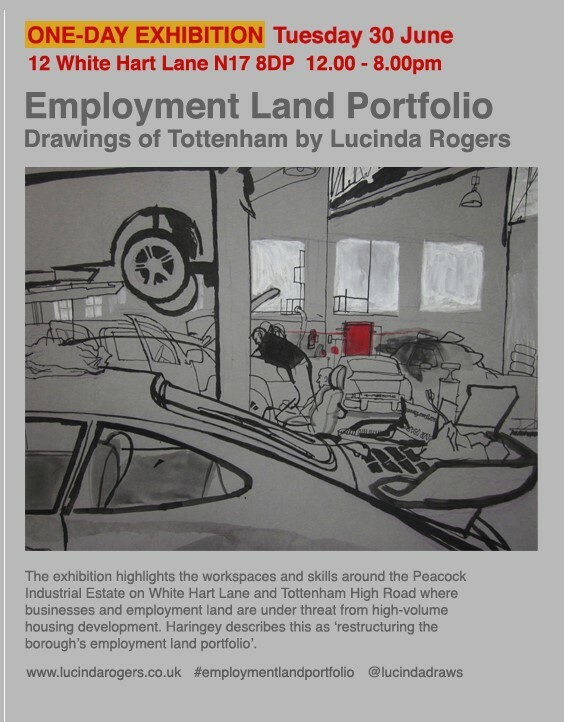 Tuesday 30 June One-day showing of Employment Land Portfolio: Drawings of Tottenham at 12 White Hart Lane beside the entrance to the Peacock Estate. There’s a major new development proposed for an ‘unused’ area bordering the railway lines at Seven Sisters and South Tottenham.